The salient feature of the new OCTAGON SF1008G + SE + CI + HD are its technical capabilities. 450MHz processor, with a total of 512MB memory you are well equipped for the future. 2 x CI + Slot`s & 2 x card readers, as well as 2 x USB 2.0 ports complete the product. Energy saver with <1Watt standby consumption! 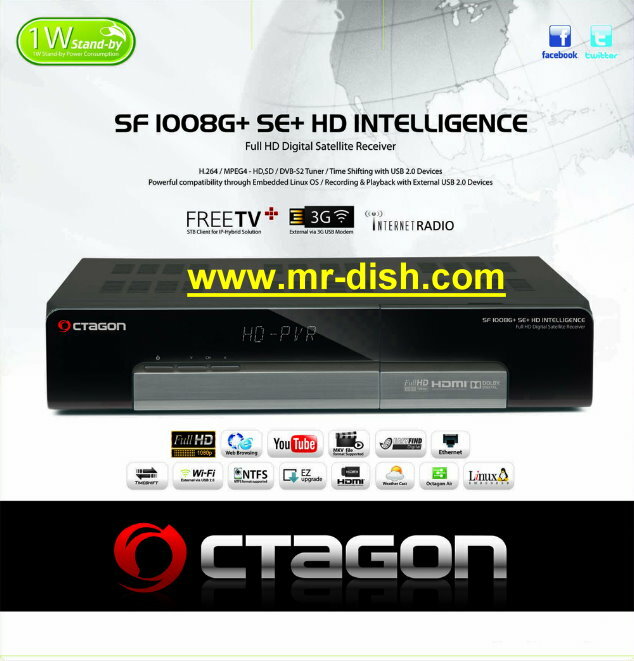 With the Octagon SF1008G + SE + CI + Full HD viewers can fully exploit the variety of multimedia options such as Youtube, Web Browser (FreeTV + Add-ons), Internet TV + (IPTV), Internet Radio + (web radio) and more. Digital television and even HDTV, whether freely receivable or encrypted, can be recorded with the multimedia expert on the hard drives (USB & LAN), clearly arranged and time-shifted. The modern Full HD tuner can watch an HD TV program and simultaneously record a program. Connection to external devices is child’s play thanks to numerous ports, allowing you to play MP3 files, photos, videos and much more.